BGP can run with HSRP although it's not advised. It can't be used for non-stop forwarding packet, failvoer does cause BGP to rest. In this example, PE1 is the active HSRP device for VIP 192.168.0.254 peering with CE1 using IP 192.168.0.253. 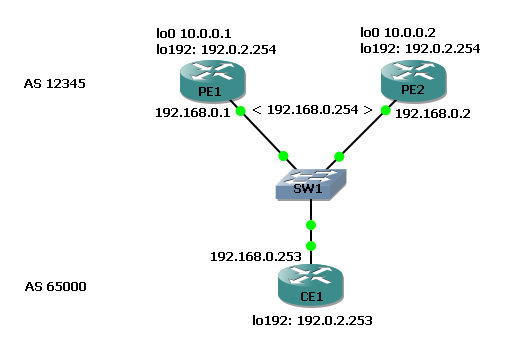 When Fa0/1 (the HSRP interface on PE1) is shut down HSRP on PE2 becomes active however no BGP session is active on PE2 to CE1 (because the ARP entriy for the HSRP address will have been switches to PE1 by SW1). CE1 will be sending BGP packets now to PE2 but PE2 will be rejecting them as there is no active session, the session will time out and when CE1 tries to re-establish PE2 will work through the BGP FSM and establish the session using the VIP. What is important here is that both PE1 and PE2 are configured with "neighbor 192.168.0.253 transport connection-mode passive". NOTE: We could have also added "neighbor 192.168.0.254 transport connection-mode active" to CE1! This places both PE1 and PE2 in to "server" mode meaning they listen on TCP port 179 and are waiting for the neighbour to initiate the connection. There is no way within the BGP configuration options to tell the router to source BGP updates from an HSRP VIP address, only physical interface addresses. This method allows the CE to do the talking, working around that limitation, at the expense of the BGP session having to flap for failover to occur (so this is only good for small customers that don't need 5 nines of uptime, although the downtime can be lower slightly by lowering the BGP and HSRP timers). None of the service provider side of the config is shown as it's not needed here.